From bean to cup... half way up a mountain. We love coffee. That should be evident from the sheer amount of coffee gadgets we've reviewed over the years. However, for us, having a coffee is something we only really tend to do at home, where we have access to all our kit. After all, it's pretty difficult to lug around your beans, grinder, filter and cup, isn't it? Well, not any more, thanks to the Cafflano all-in-one coffee maker. What looks like a simple travel mug is actually everything you need to make a decent cup of filter coffee, with the exception of the kettle. 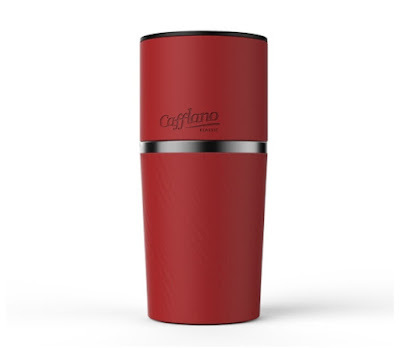 Screw off the top of the Cafflano and you'll find a hand-grinder (complete with fold-away handle), a filter cone with a fixed mesh filter, and an insulated travel mug on the bottom. The Cafflano's top section doubles as a drip-kettle, and features a teeny tiny spout. Basically (and we've tried this a few times now) you pop your beans into the top of the Cafflano, screw on the top, and head out to wherever you're off to. This might be the office, it might also be Mount Everest. Regardless of eventual destination, once you get there and fancy a fresh cup of Joe, simple boil some water. While that is happening (remember, only take it up to 95 degrees! ), unscrew the Cafflano's top, fold out the grinder handle, and get grinding. The grounds will automatically fall down into the next section - the filter cone - meaning you can give it some wallop. The grinder is actually quite good, with a ceramic burr head which is adjustable. Right, unscrew the grinder, and by now your water should be ready. Pour it into the upturned lid, or Drip-kettle, and slowly pour this over the awaiting grounds. The narrow spout will prolong the time it takes the water to fall, allowing the coffee to be properly brewed and to not overflow the filter cone. We found that every once in a while during the pouring process, a quick stir of the grounds was necessary to increase surface area. The filter coffee will then - very slowly - drip through into the final section, the cup. This is quite well insulated and has a spiral texture around the outside allowing for better grip. Add your sugar (which you could have stored in the lower section all along), stir, and drink. Once done, pack it all up and store away in your bag for tomorrow. This is all very clever - not the technology involved, but the fact that it has all been compressed together in this way. We thought it made a very good cup of coffee - not great - but being able to grind fresh beans and brew a pour-over coffee literally anywhere, certainly makes up for that. We thought the filter cone let it down slightly, as often we could taste little grits of grounds in the final drink, but it was still quite effective. We can imagine this being an absolute life-saver to coffee-addicts going camping or hitting the festivals this summer. Combined, the Cafflano really doesn't take up any more room than your travel flash would anyway, so if you are hitting the road soon, and feel like you might miss a fresh cup of the black stuff, go for it.